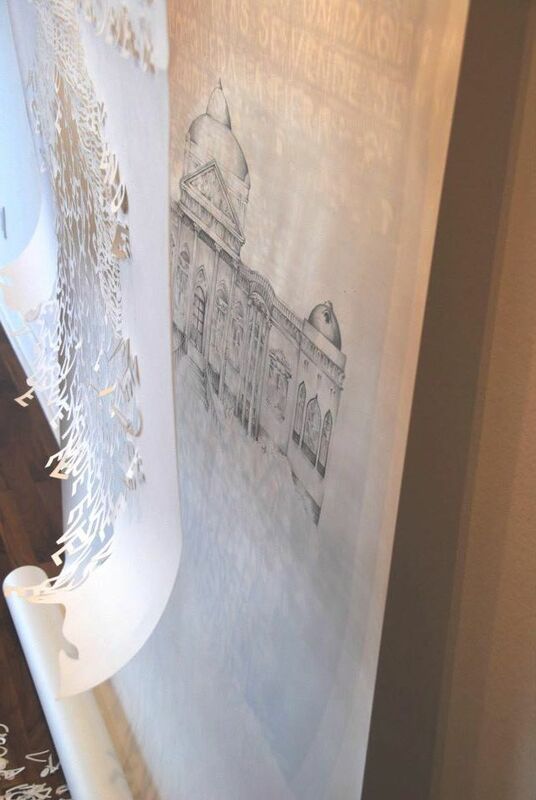 Transience, transculturation, and displacement-themed visual poetry installations that integrate cut-paper sculpture, graphite drawing, and recorded sound. 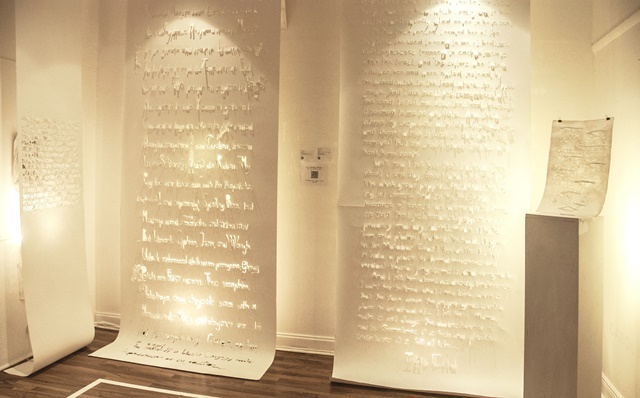 Floor to ceiling in size, the pieces are cascading blankets of white paper, carved delicately with letters dangling off the page. Imbued with movement and aglow with diffused light, these floating letters translate the extemporaneous vibrancy of language and are intended as ethereal manifestations of the spoken word. The ephemeral quality of paper adds to the effect with its frailty, yet the irreversible act of cutting reinforces the permanent nature of words. As words cannot be unsaid, so a paper cut is the ultimate in commitment. This concept serves the worksb thematic content well b the pieces center on the role language plays in cultural assimilation, identity, and the experience of exile and transience. 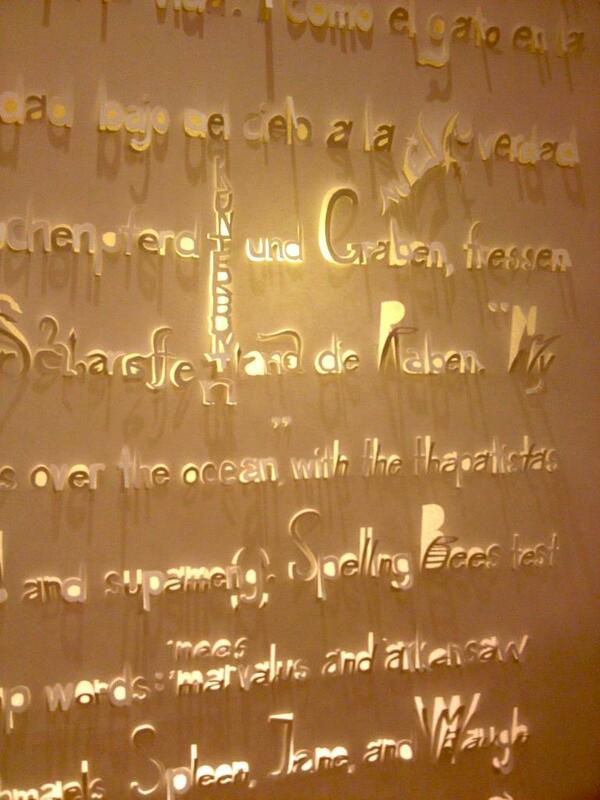 "Spelling Bee" (2012), for example, is a whimsical floor-to-ceiling visual poem in four languages that traces a young girl's linguistic journey across continents and expresses her search for an individual voice in the remembered fragments of sound from birth through a landscape of multi-ethnic fairy tales, lullabies, and traumatic moments of phonetic confusion. The German-language "Illegible" (2011), incorporating a graphite portrait and poetry 'chant', addresses obscuration of identity through foreign language as part of the immigrant experience. 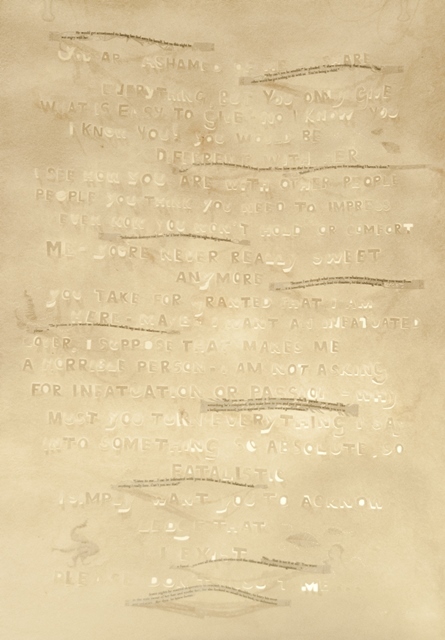 The small-scale "A-Mended Conversation" (2013) trilogy, is cut from Mexican amate bark and embroidered with printed text from the original manuscript for Carola Perlabs postwar exile novel "Gibbin House". The amate's traditional uses highlights conflicting gender, culture, and class roles as defined by the novel's fictional characters. "Se Vende" (2013) is the latest work and opens a discussion on the loss of cultural continuity with the demolition of Casa Marsano, an ancestral estate and Lima landmark. 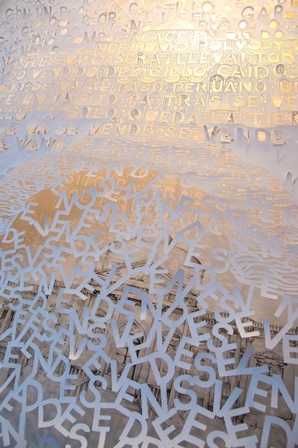 A graphite representation of this site emerges from behind a carved wall-sized 'chant' poem that uses the Spanish 'For Sale' expression (Se Vende) as its central 'word motif'. In "Se Vende", the poem invokes Limean history and folk references, their melancholy devaluation mirrored by the ever-crumbling letters and the building's spectral silhouette which hovers amid fine incisions. The autobiographical nature of the subject connects it to a generation of émigrés whose Peruvian identity is brought into question by the destruction of this distant yet iconic legacy. Carola continues to work along the same themes with the upcoming "Konzeption" series, which will see the creation of a novel within a visual art work and trace its evolution therein.B The semi-autobiographical novel is set in the Peruvian Amazon during the guerilla uprising of 1980 and follows the journey of a European immigrant family caught in the struggle. .
Carola Perla, Artist's statement: "My work comprises illuminated cut-paper sculpture with visual poetry, graphite drawing, and recorded sound elements that treats transculturation and displacement through multi-lingual poetry, autobiographical source material, and exile-themed published prose. The back-lit floor to ceiling installations are meant to act as room-sized conversations, presenting subjects such as an immigrant obscured by foreign words, a childbs discovery of self through memories of changing languages, a demolished landmark and its effects on the fabric of cultural continuity, etc.B Ethereal in design, the sculptures feature delicately dangling letters that seem to float off the paper and further echo movement and btransienceb.B This work is informed by my own early exile from Romania, consequent migratory childhood, and my ongoing search for home, voice, and an understanding of the process by which we construct new identities".